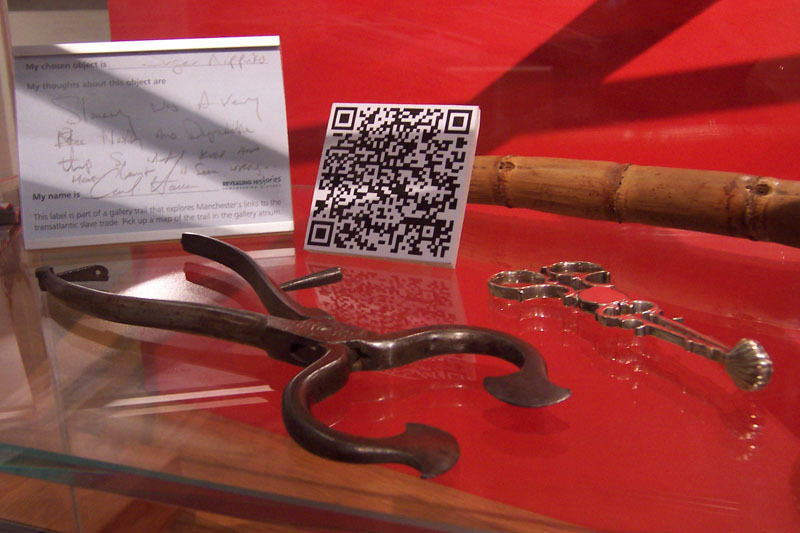 ‘Revealing Histories’ display showing QR code. My first assignment as a consultant was to research and write a report on ‘Machine readable labelling in museums’ for the London Museums Hub. I visited museums in Cambridge, London, Manchester, Norwich, and Rotterdam and cited other examples of practice in London, Melbourne and San Francisco. I looked at regular barcodes as well as newer types such as QR codes, as well as RFID tags. A spin off from the research was setting up a pilot to trial the use of QR codes in Manchester Art Gallery since there was a lack of an example of use of QR codes at the time in museums. The pilot supplemented a display ‘Revealing Histories’ at the Gallery and involved adding QR codes alongside the regular labels and working with a technology partner Matt Haworth. It was at a time when smartphones were becoming more popular and participants were able to scan the codes, read more about the objects on display, and submit comments for others to share. It was a very positive experience and it led to a later project ‘Decoding Art’. The report was published on the London Museums Hub website, since dismantled, and is now available on a specialist website, Smart Track RFID.